Each Ardell Little Black Dress Kit (HOT DATE) contains 2 PAIRS of accent lashes (one natural, one glitter), one tube of lash adhesive, and one pair of tweezers. Ardell The Little Black Dress... lashes...the essential for every woman's arsenal of goodies! From first dates, to cocktail parties, to those intimate candle lit dinners, the Little Black Dress is perfect for that special evening out. The faux fringe takes your eyes from drab to fab in minutes. Designed as eye accents, these lashes are half the length (HALF / PETITE LASHES) of typical lashes and are to be used on the outer corners of the eyes for that glamourous, yet coy cat-eyed look. The kit is equipped with two styles of lashes, one natural looking style and the other with just a bit of glitter to make your eyes sparkle! 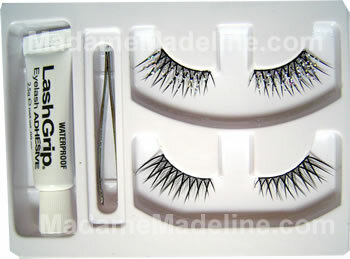 Adhesive and a pair of tweezers for easy application are also included in the kit. From formal affairs to a night-out-on-the-town, these lashes are just what you need to create natural looking lashes with a twist of glamour and style.